My second trip to Revelstoke of the 2015-16 season was filled with uncertainty. Leaving Williston, ND, I had received countless reports of poor snow conditions, some from credible sources. But, Colorado was none better; only a few days before, I had spent a week with Klim on the Backcountry Team event. Departing North Dakota, I didn’t even know with whom I’d be riding, at least in the short term; the Thunderstruck and Klim crews would arrive no earlier than Tuesday evening. But, I thought, it’s Revy, and I’m sure I can make something happen. On the 15-hour drive, I had ample time to make as many phone calls, texts, and emails as I could think of. Unfortunately, nothing was panning out. I pulled into Banff and grabbed a steak, my mind at a loss, wondering what I would do for four days. 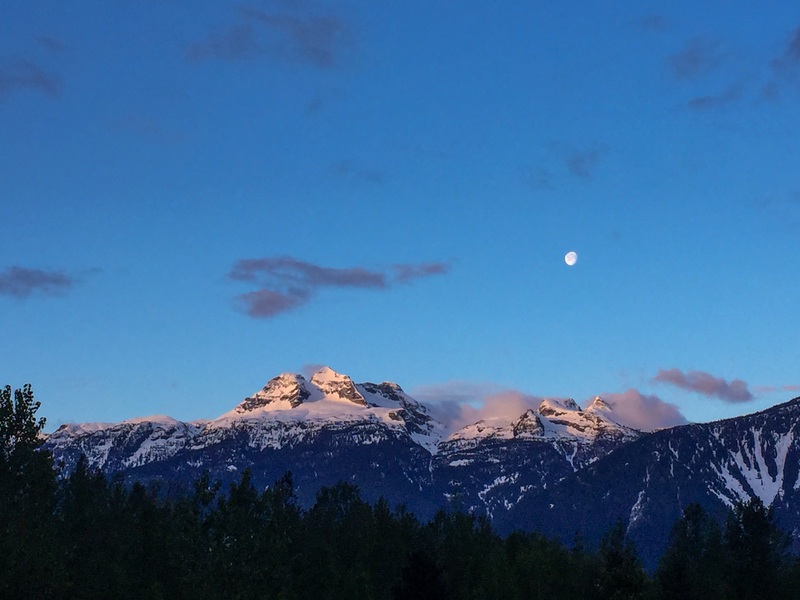 By the time I had stuffed my belly, I was too tired to care, and pressed on to Revelstoke. The next morning, I took it upon myself to explore the town. I hadn’t really been downtown, except to eat and bowl. So, I meandered around, well into the afternoon, when I finally wandered into The Village Idiot, a local bar and grill. I enjoyed the daily special of chicken tacos and politely conversed with the bartender (who let me put a sticker on the ceiling. It turns out that she was a snowmobiler, and several of her sledding friends had a fun day of activities planned. They let me join in, and I spent the day at the hot springs and enjoying the breathtaking scenery of the backcountry. On our way back home, I received a text from Shad Simmons. 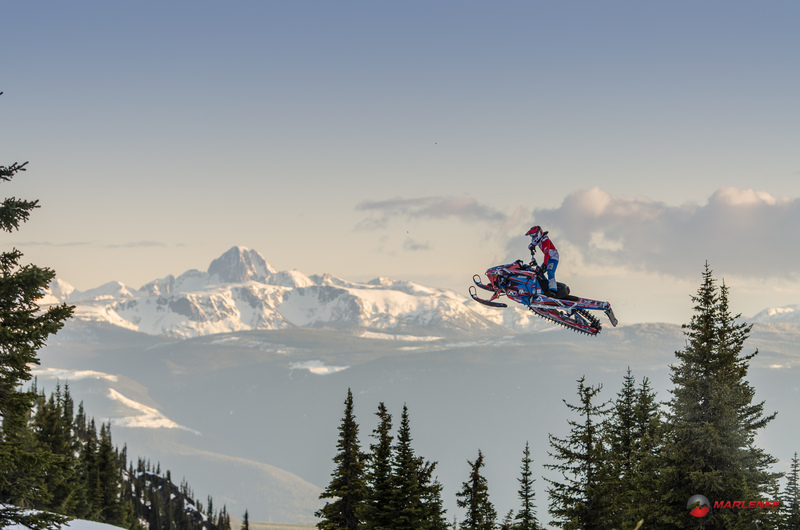 He was up at Turcotte’s compound near Kelowna, and they had an epic day planned. It was already almost 10:00 PM, and I was tired. Turcotte’s house is about four hours from Revelstoke, and they wanted to leave for the hills, no later than 10:00 AM. “Ugh”, I thought. Quickly, my disdain at not being able to sleep in was gone, as I packed my gear and set my alarm. I got out of Revy by 5:00 AM, and the traffic was minimal, until I reached Kelowna. Stuck behind miles of RV’s, I slowly wound my way down the old logging highway to Clearwater, where I met Shad Simmons at the local A&W. We ate a filling breakfast and headed up to the Turcotte Compound. Nestled peacefully away in the hills beyond Clearwater, sits a log cabin. Facing outward, the great room and it’s two-story windows oversee the valley. Brett Turcotte and Jamie Iwaschuck were dutifully preparing sleds and trucks for the impending ride. Just before leaving, we stopped at the Double-R for pizza, and everyone treated Turcotte like their son or cousin. I often miss that small-town feel. Leaving town, it was only about five minutes before the snow was deep enough to force us to unload. Looking back on the valley, spring was in full effect. Waterfalls were flowing at capacity and the deciduous trees were full of rustling leaves. You could hear water rushing underneath the snow, and it had eaten away at the trail in several spots. I was the slowest, again laden with gear, but made every effort to keep up. Less than three miles in, the trail ended. The layout was extremely contoured; a freestyle playground. The terrain offered perfect transitions, impressive gaps, and endless features. The open end of the bowl overlooked an impressive range, somewhat resembling the Tetons. When we first arrived, the wind was violently whipping and the moist fog kept setting and then rising. Each person gathered at Turcotte’s cache, where we each grabbed a large scoop shovel and used our brake-hand to tow it a few hundred yards to one of Turcotte’s many jumps. In addition to my camera gear, I had brought the last of the salt bags I keep stashed beneath my sled deck (just in case of emergency, you know). We spent the next few hours shoveling on two different jumps. It was an assembly line process, as we cut out perfect blocks and neatly stacked them, filling the gaps with the mashed-potato snow from around the jump. As the tail end of the jump rose, the pit just behind it deepened. We joked about starting a fire in there for dramatic effect. Now, sweaty and tired, the fog had once again set in and wind had picked up. We carved out seats in the pit, and patiently waited for Turcotte and Shad to return from their scouting mission. Jamie Iwaschuck tried to start a fire, but the alpine-growth trees provided little fuel, and even less heat. Almost at once, the fog lifted, alpenglow started, and Simmons and Turcotte had returned. Brett joked with us about sitting down on the job, but everyone hustled to get into place. The next thirty minutes were a mixture of utter chaos, machine-like precision, and perfect timing. 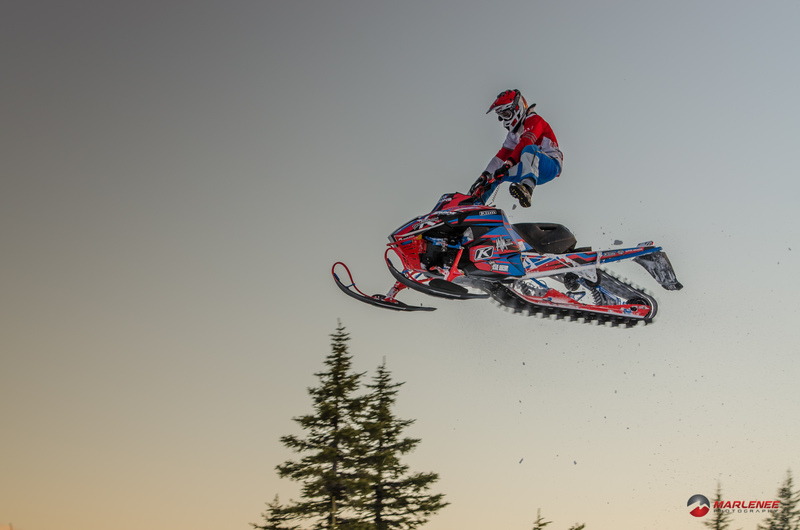 For Turcotte, Iwaschuck and Simmons, they routinely hit several jumps, over and over again. There was barely time, between partcipants, for my camera to write to the SD card. Add to that, the fact that I was operating my video camera, still camera and my drone. Thankfully, we all had help and everyone passed the devices around as we captured the entire session. Returning back to Turcotte’s house, I was excited to say hi to his wife and new daughter. We ate some snacks and reviewed footage. One of Turcotte’s videographers, a man named Eddie, who was from Hong Kong, was nearly finished with Turcotte’s segment and footage for 509. They were still looking for a couple final shots to complete, and I think he got it. As I put my gear away, Turcotte and Simmons tried to convince me to stay, just for another day. Simmons was to attempt a backflip the following day, and I did want to try and catch it, but I had also made commitments to Jim Phelan and Sid Huntsman for the annual Revy trip, so I had to decline. I left Turcotte’s around 10 PM, and didn’t make it back to Revelstoke until 2 AM. The entire drive home, I could only think how fortunate I was to get to spend a day with yet another group of riders. I hoped that my pictures and video would turn out, and be used. But, more than anything, I hoped for another invite.